Recruiting can’t be left to chance. Our proven methodology helps you develop a recruiting strategy by using processes based on data, not emotions or best guesses. As with everything we do, our process starts with taking the time to listen to you so we can learn and understand your goals. 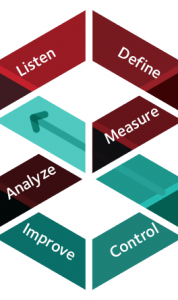 The Six Sigma DMAIC methodology gives us a solid framework for this stage. We can’t solve the problem without having a clear, measurable and achievable goal. We always use a data driven measurement to track progress. Reviewing the data lets us efficiently develop a road map for improvement. This is where we take action based on the results we’ve gotten. We make any changes necessary to the recruitment process, solution or design to make sure you reach your ultimate goal. Continual progress is only possible if we maintain the solution and the changes we’ve implemented. We make sure you stay on track.